With Iron Maiden's Alexander The Great as number one in the playlist we are tasting Craigellachie 13 yo. The Craigellachie 13 YO is a new bottling by John Dewar & Sons and introduced at the same time as the Aultmore 12 YO and a revamped Aberfeldy 12 YO as part of the Last great Malts. Glen Deveron and Royal Brackla will follow. 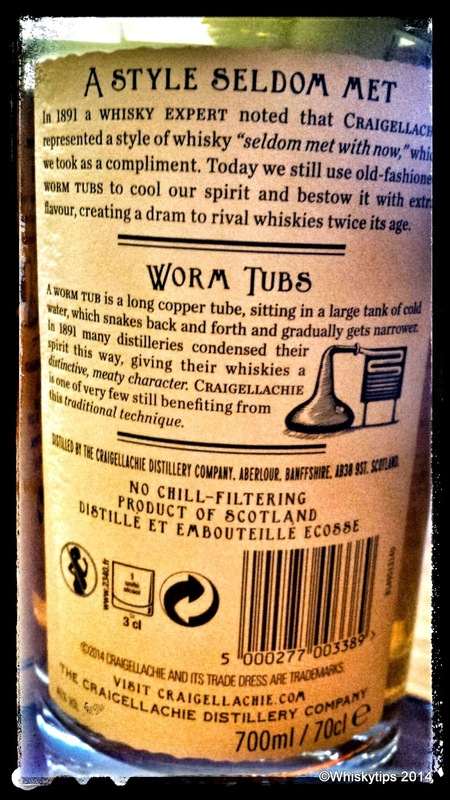 Craiggelachie is one of the 15 distilleries in Scotland that still use (traditional) wormtubs. To be honest, we couldn't tell you what difference it makes to the spirt or end result for that matter, but according to the information on the tube it gives the whisky "a distinctive and meaty character". More importantly the label states this whisky is non-chill-filtered. No word about colouring, but maybe whisky friends in Germany of Denmark can comment on that. In these countries adding caramel must legally be displayed on the label. Another plus is the bottling strength at 46%. 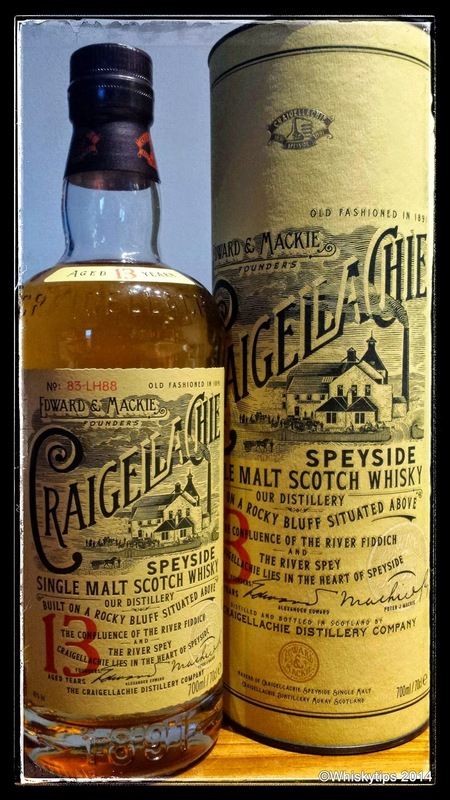 Together with the 13 yo a 17 YO and 23 YO Craigellachie will be released and even a 31 so we were told. First impression is good, great bottle (with embossed distillery name in the top front), great tube design. Every bottle is individually numbered. Taste: Honey, firm, the burned oak is there. As there is toasted bread. Anis, green tea and almond. A liquid cupcake this is. We were already happy with the Aultmore, but this is even more to our liking. A thick Speysider, sweet, oily character. One to savour before dinner or two after. Hurray for the chaps at John Dewar's for releasing this expression as a single malt. And at a decent price as well. We will look out for the other expressions and have a wee taste. I really like the Balvenie Sherry Oak 17 anos , .